Following the abolition of the Bagratid monarchy of Kartlo-Kakheti in Eastern Georgia, the liquidation of the branch of the dynasty ruling in Western Georgia was only a matter of time. King Solomon II of Imereti defended his independence as long as he was able. Taken under Russian suzerainty in 1804, Solomon later revolted and was deposed and captured by armed force in 1810. The smaller independent principalities of Western Georgia were gradually absorbed into the administrative framework of the Caucasian Viceroyalty. Guria was taken over in 1829, Mingrelia in 1857, Svaneti in 1858 and Abkhazia in 1864. Prince Tsitsianov, who … succeeded Knorring as commander-in-chief, … rapidly extended Russia's grasp on Transcaucasia. He saw the urgency of securing as rapidly as possible the entire area between the Black Sea and the Caspian. From his headquarters in Tbilisi, he turned his attention westwards to Imereti. Western Georgia was at this time torn by a feud between King Solomon II of Imereti and his nominal vassal, the semi-independent prince-regent or Dadian Grigol of Mingrelia. 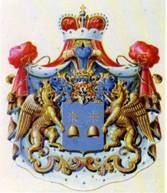 One of Grigol Dadian's predecessors had sworn fealty to the Tsar of Russia as long ago as 1638. Now, in 1803, his country was taken under direct Russian suzerainty. In contrast to the situation in Eastern Georgia, the local administration was left to the princely house, which retained control under nominal Russian supervision until the dignity of Dadian was finally abolished in 1867. With his principal vassal and foe now under Russian protection, King Solomon of Imereti felt it wise to feign submission. His dominions also were in 1804 placed beneath the imperial aegis, under guarantees similar to those given to the Dadian. However, Solomon remained at heart bitterly opposed to his foreign overlords, and his court at Kutaisi was a hot-bed of anti-Russian intrigue. .. Under Tsitsianov's successors, the war against Persia and Turkey continued with varying success and great ferocity. On the Persian front, Derbent and Baku were at last annexed in 1806, though a second attack on Erivan in 1808 ended in another costly failure. 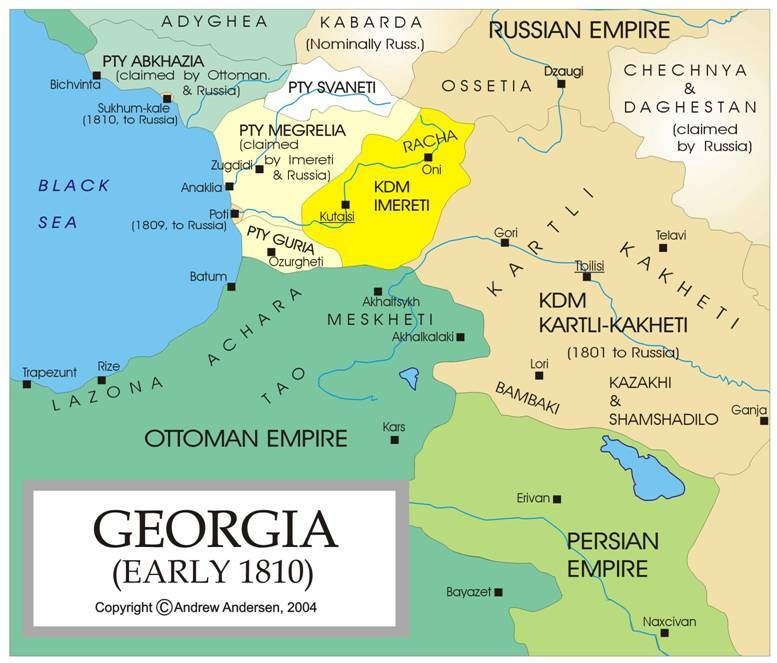 In Western Georgia, the Russians kept up their pressure on the Turks, from whom they took the Black Sea port of Poti in 1809, Sukhum-Kaleh on the coast of Abkhazia in 1810, and the strategic town of Akhalkalaki ('New Town') in south-western Georgia in 1811. The remaining independent princes of Western Georgia hastened to accept Russian suzerainty. In 1809, Safar Bey Sharvashidze, the Lord of Abkhazia, was received under Russian protection and confirmed in his principality. Prince Mamia Gurieli, ruler of Guria, was taken under the Russian aegis in 1811, receiving insignia of investiture from the Tsar. Only King Solomon II of Imereti held out to the bitter end. Encircled by Russian troops, the king strenuously resisted an demands for submission, in spite of the fact that he had earlier, under pressure, sworn fealty to the Tsar. In 1810, the Russians despatched an ultimatum to Solomon, demanding that he hand over the heir to his throne and other Imeretian notables as hostages, and reside permanently under Russian surveillance in his capital at Kutaisi. Solomon refused, and was declared to have forfeited his throne. Hounded by Russian troops and by Georgian princes hostile to him, he sought refuge in the hills, but was soon captured and escorted to Tbilisi. A few weeks later, Solomon staged a dramatic escape from Russian custody, and took refuge with the Turkish pasha at the frontier city of Akhaltsikhe. Inspired by this daring feat, the people of Imereti rose against the Russian invaders. Ten fierce engagements were fought between the Russian forces and the guerillas of Imereti. Famine and plague broke out, and some 30,000 people perished, while hundreds of peasant families sought refuge in Eastern Georgia. Eventually the patriots were crushed by armed force. A Russian administration was set up in Kutaisi, the country placed under martial law. 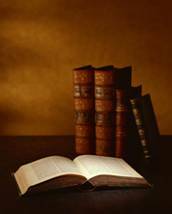 King Solomon now applied for help to the Shah of Persia, to the Sultan of Turkey, and to Napoleon Bonaparte himself. To the Emperor of the French, Solomon wrote in 1811 that the Muscovite Tsar had unjustly and illegally stripped him of his royal estate, and that it behoved Napoleon, as supreme head of Christendom, to 'take cognizance of the act of pitiless brigandage' which the Russians had committed against him. 'May Your Majesty add to your glorious titles that of Emperor of Asia! But may you deign to liberate me, together with a million Christian souls, from the yoke of the pitiless emperor of Moscow, either by your lofty mediation, or else by the might of your all-powerful arm, and set me beneath the protective shadow of your guardianship!" 26 Napoleon himself was, of course, quite a connoisseur of 'pitiless brigandage'. However, this eloquent plea, which reached him shortly before he set out on his ill-fated campaign to Moscow, provided him with encouraging evidence of the unsettled condition of Russia's Transcaucasian provinces. But as things turned out, Napoleon could not save even his own Grand Army from virtual annihilation, let alone a princeling down in the distant Caucasus. Without regaining power, Solomon died in exile in 1815, and was buried in the cathedral of Saint Gregory of Nyssa in Trebizond. The elimination of King Solomon did not bring civil strife in Georgia to an end. No sooner was Western Georgia outwardly pacified than fresh troubles broke out in Kartli and Kakheti. Ten years of Russian occupation had greatly changed the attitude of a people who, a decade before, had welcomed the Russians as deliverers from the infidel Persians and Turks. Called upon to furnish transport, fodder and supplies to the Russian Army at artificially low rates, and regarded by their new masters as mere serfs, the Georgian peasantry looked back wistfully to the bad old days. Under the Georgian kings, though invaded and ravaged by Lezghis, Persians and Turks, their country had at least been their own. Now it was simply an insignificant province, engulfed in a vast, alien empire, whose rulers seemed lacking in sympathy for this cultivated, Christian nation which had voluntarily placed itself under the protection of its northern neighbour. It was at this period that Mingrelia, the Colchis of the ancients, finally lost its autonomy. It will be recalled that the Dadian or ruling prince of Mingrelia had been placed under a Russian protectorate in 1803, but had retained a large measure of authority as a vassal of the cause, and organized a militia to help drive out the intruders. This invasion imposed a severe strain on the Mingrelian economy, and particularly on the peasants. When the Turks withdrew, the landowners attempted to reimpose their authority on their serfs, but were met with defiance. A peasant revolt broke out, led by a blacksmith named Utu Mikava. Most of Mingrelia was reduced to a state of turmoil. In the end, both parties welcomed Russian intervention--the landowners to safeguard their lives and property, the serfs in the hope of being guaranteed a status approximating to that enjoyed by crown peasants in Russia. Fate thus played into the hands of the Russian authorities, who sent in 1857 a commission to Mingrelia, and removed the Regent Catherine from office. 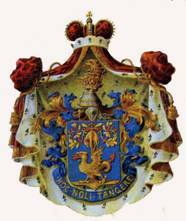 A Russian-dominated Council of Regency was set up, nominally in the interests of the youthful heir, Nicholas Dadiani. In 1867, when Nicholas attained his majority, he was compelled to cede all his sovereign rights to the Tsar in exchange for 1,000,000 rubles, a grant of estates in Russia, and the title of Prince Dadian-Mingrelsky. The principality of Mingrelia thus became an integral part of the Russian empire. A like fate soon overtook the free mountaineers of Upper Svaneti, high up in the Caucasus range looking down over Imereti and Mingrelia. The Russians had long been irked by the rebellious attitude of the Svanian princes, who spent their ample leisure in prosecuting blood feuds against one another, and in intrigues with Omar Pasha's invading Turks. In 1857, Prince Baryatinsky ordered Svaneti to be subdued by armed force, despite the existence of the treaties of 1833 and 1840, which established a protectorate over the principality of Western Upper Svaneti and the self-governing tribal area of Free (Eastern Upper) Svaneti. 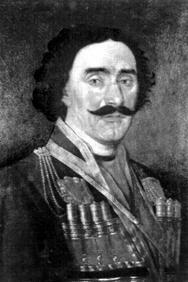 The ruling prince of Western Upper Svaneti was exiled to Erivan in Armenia. On his way to banishment, this Svanian prince, Constantine Dadeshkeliani by name, came to Kutaisi for a farewell audience with the Governor-General of Western Georgia, Prince Alexander Gagarin, a jovial man and a good administrator, who had built a boulevard and two bridges over the Rioni at Kutaisi and embellished the town with a public garden. At this interview, Constantine Dadeshkeliani suddenly drew his dagger and stabbed to death the Russian general and three of his staff. When captured, he was summarily tried by court martial and shot. In 1858, the whole of Upper Svaneti was annexed to the Russian viceroyalty of the Caucasus. Thus ended the independent existence of this renowned nation of fighters and hunters, mentioned with respect by Strabo and the ancients, but sunk in more recent times into squalor and ignorance from which contact with European ways has only lately begun to redeem them. The Russians were now able to subjugate Abkhazia, the autonomous principality situated immediately north-west of Mingrelia along the Black Sea coastline. It will be recalled that the Lord of Abkhazia, Safar Bey or Giorgi Sharvashidze, had been received under Russian protection as long ago as 1809, and confirmed in perpetual possession of his domains. In the intervening period, Abkhazia had been frequently involved in the Russian campaigns against the Circassians, with whom the Abkhaz, many of them Muslims, had cultural, ethnic and linguistic connexions. During the Crimean War, the Turks stirred up the Abkhaz against Russia at the time of null Omar Pasha's invasion of Mingrelia. Turkish envoys who arrived at the Abkhazian capital, Sukhumi, found the ruling dynasty of the Sharvashidzes divided: the Christian princes adhered to the Russian interest, but Iskander (Alexander), a Muslim, was prepared to help the Turks in return for permission to annex the neighbouring Mingrelian district of Samurzaqano. Omar Pasha had subsequently landed at Sukhumi, from which he advanced south-eastwards into Mingrelia. After the Crimean War was over, the Russians looked for a chance of extending their direct rule to Abkhazia. In 1864, they deposed the ruling prince, Michael Sharvashidze, and annexed his country by force of arms. Two years later, the Abkhaz staged a general revolt against their new masters, and recaptured their capital, Sukhumi. The Russians had to send 8,000 troops to quell this rising, which was suppressed with heavy loss of life. The subjugation of Abkhazia coincided with Russia's annihilation of the national existence of the Circassians, that valiant North Caucasian people who had for a century been a thorn in the side of Tsarist colonialism. Cut off since the Crimean War from contact with Turkey and the Western European powers, the Circassians were no match for Russia's military might, especially after the surrender of Shamil and the Murids of Daghestan. In Chechnya and Daghestan, the Russians were satisfied with the submission of the local population to Russian law. 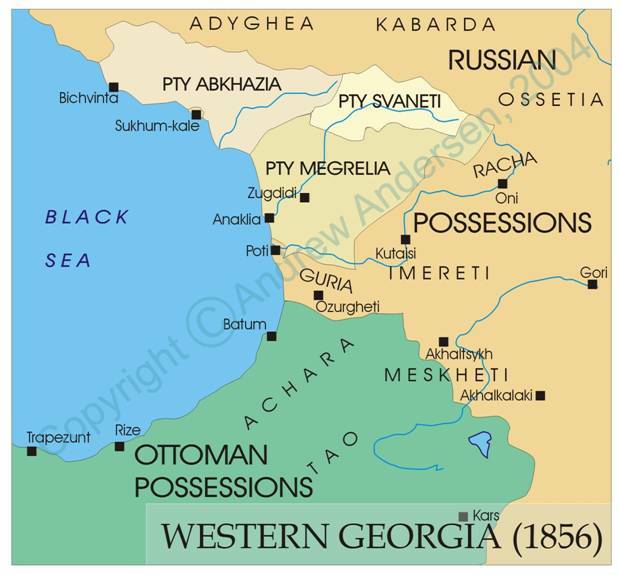 But on the Black Sea coast, their plans involved the seizure of the wide and fertile Cherkess lands to provide for a part of the wave of Russian peasant migration which resulted from the emancipation of the serfs in 1861. The Russian government conceived the drastic project of enforcing the mass migration of the Circassians to other regions of the empire or, if they preferred, to Ottoman Turkey. The last shots in the long series of Russo-Circassian conflicts were fired in 1864. Rather than remain under infidel rule, some 600,000 Circassian Muslims emigrated to various regions of the Ottoman Empire, where their descendants may be found to this day. Many of the Russian, German, Greek and Bulgarian colonists who were endowed with the tribal lands of the Circassians near the Black Sea coast proved unable to endure the sub-tropical climate, and the wilderness invaded the orchards and gardens once cultivated by prosperous and highly civilized Circassian communities. 26. French diplomatic archives, Quai d'Orsay, Paris, as quoted in M. Lang, The Last Years of the Georgian Monarchy, pp. 263-65.